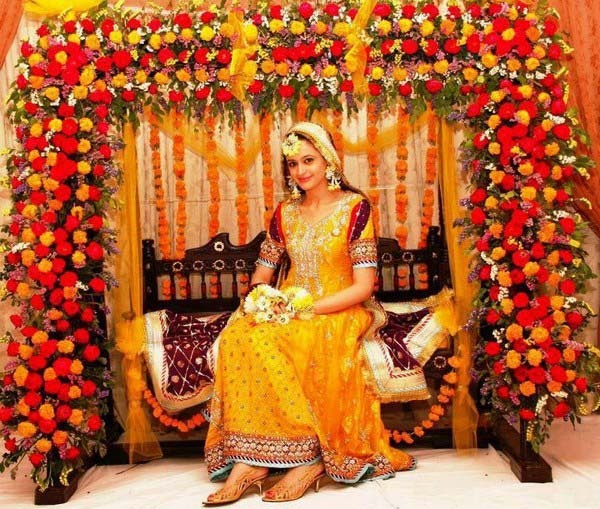 Eastern weddings, especially in India and Pakistan includes a chain of functions that are full of rituals and colors and the event of mayoun and mehendi are one of them. 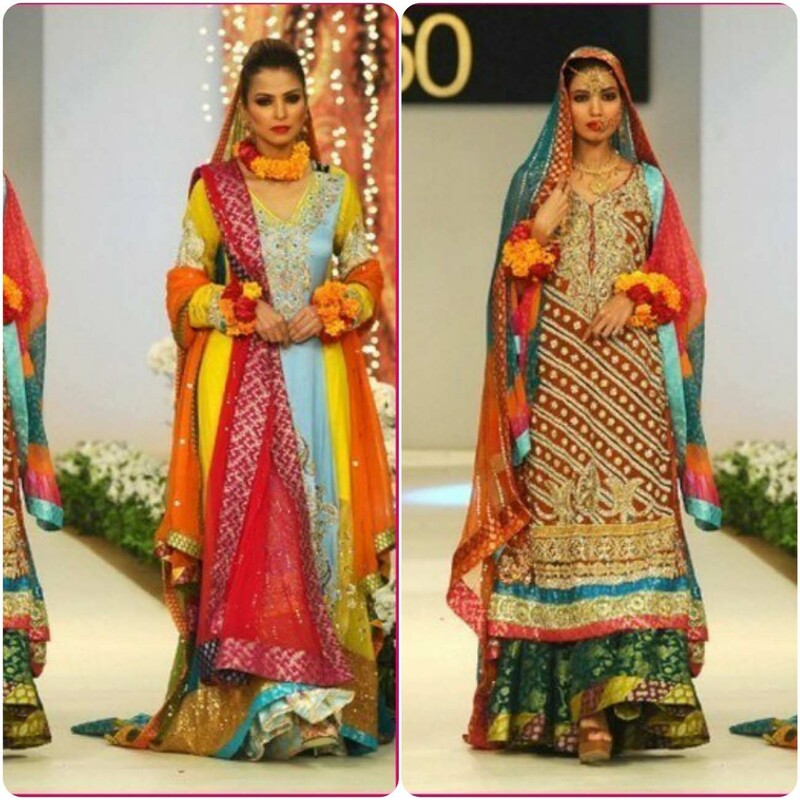 These events are noticeable by the colors of henna and shades of green and yellow. 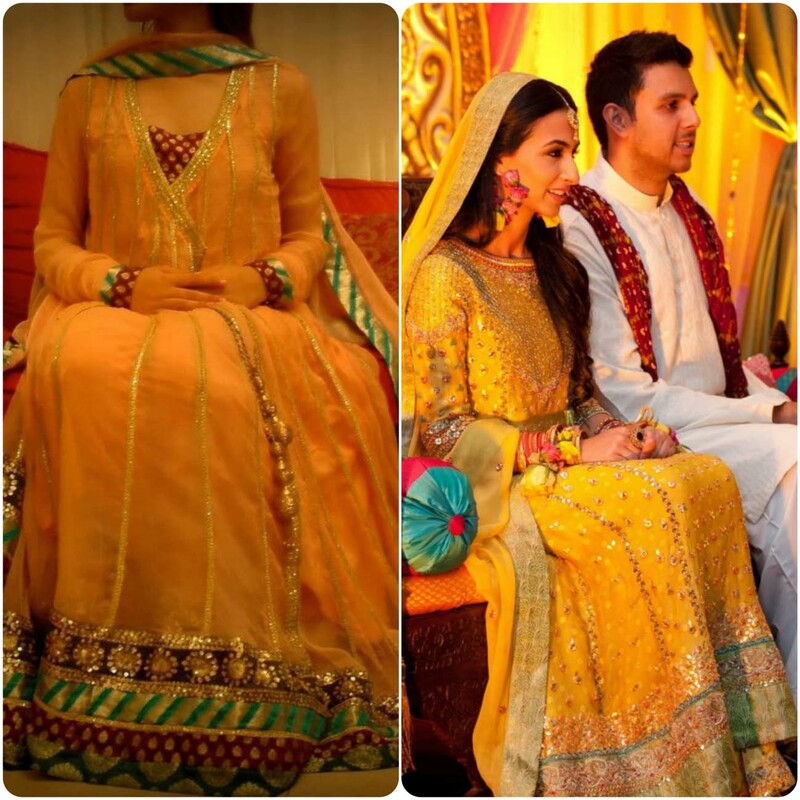 The bride is fully covered with green and yellow glimpse and the mayoun event is part of pre-wedding and a way to celebrate this ceremony with rituals, melodies and songs that makes this day more joyful. 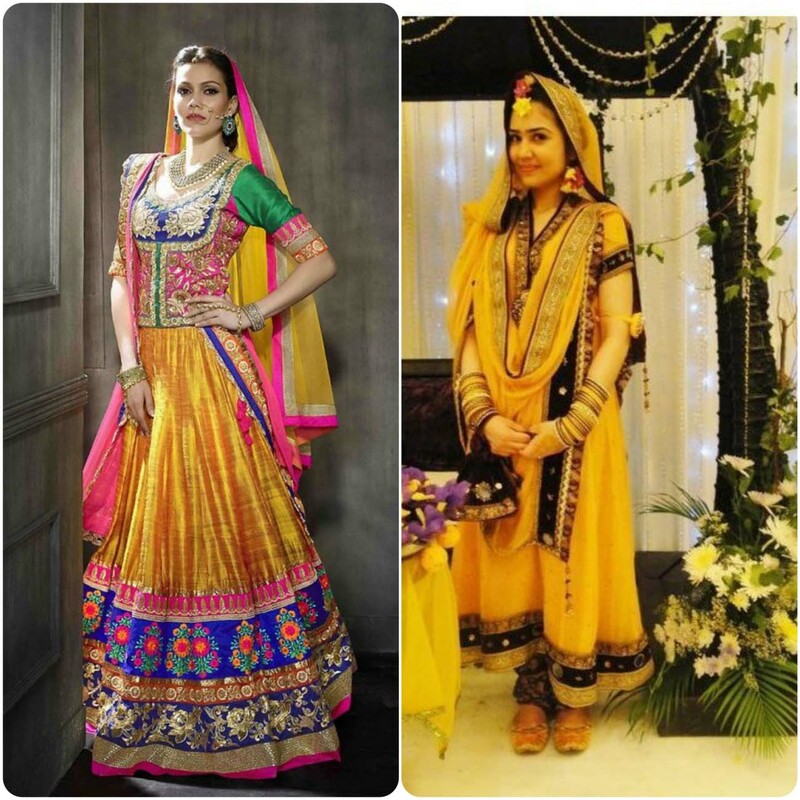 Now this function has risen to the quite new level and it is organized with songs, dances and sangeet fun. 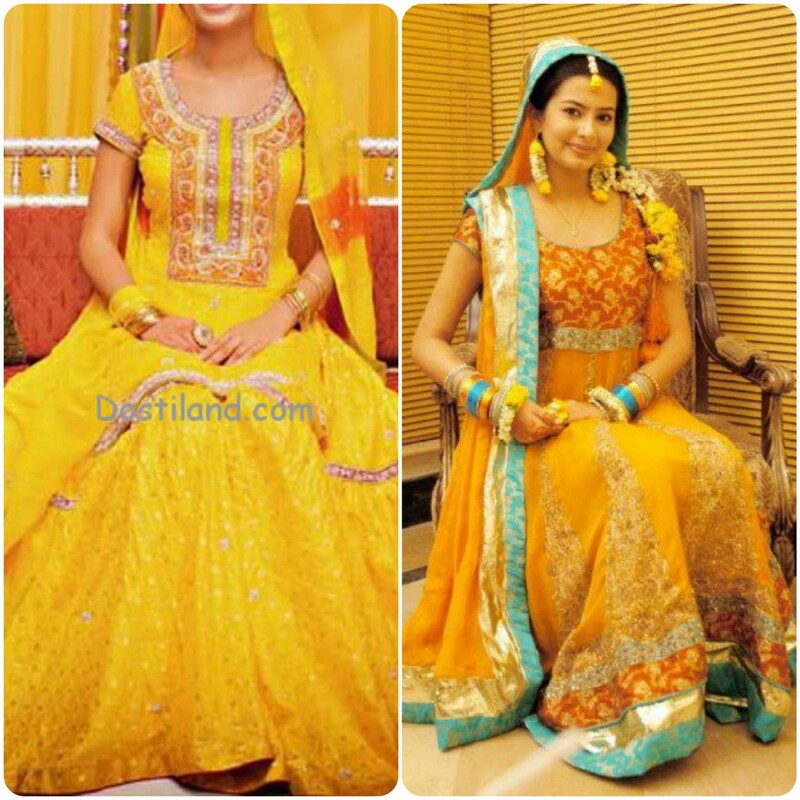 As you can see Asian Bridal Mehendi Dresses Designs For Girls 2017-2018 add more elegance these functions. 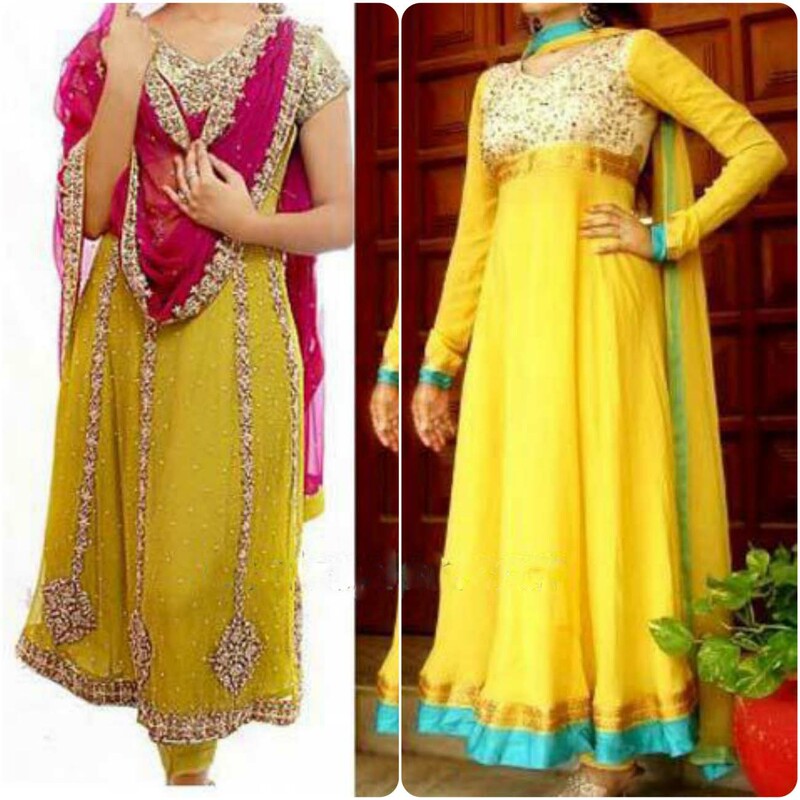 As the occasion of Mehendi has gained much popularity and importance, at the same time does the outfits of bride for this event. 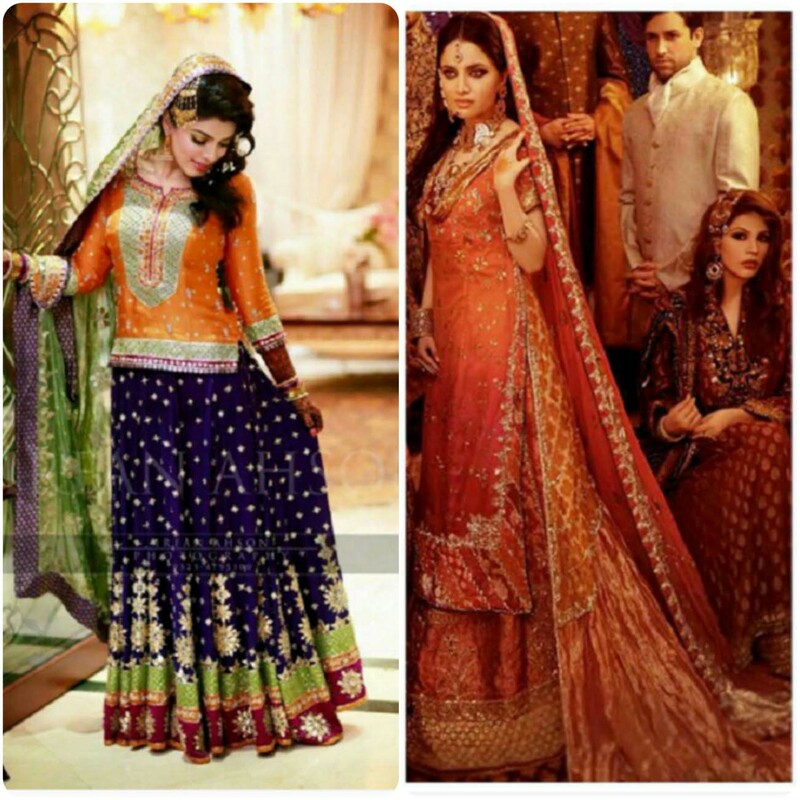 Though in old times, it was not celebrated with such funs and they follow simplicity, but now it becomes more glamorous. 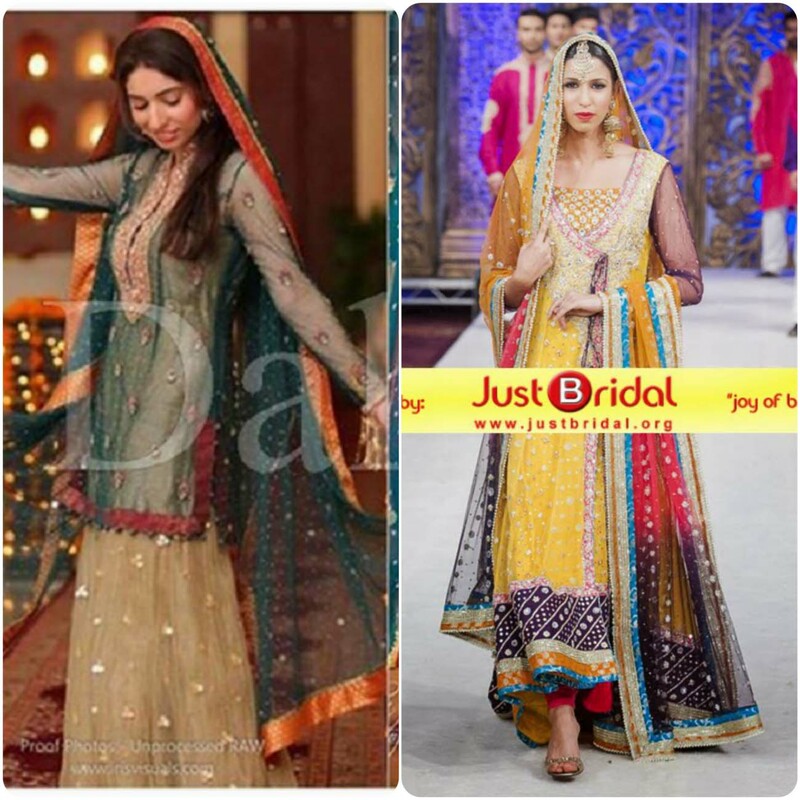 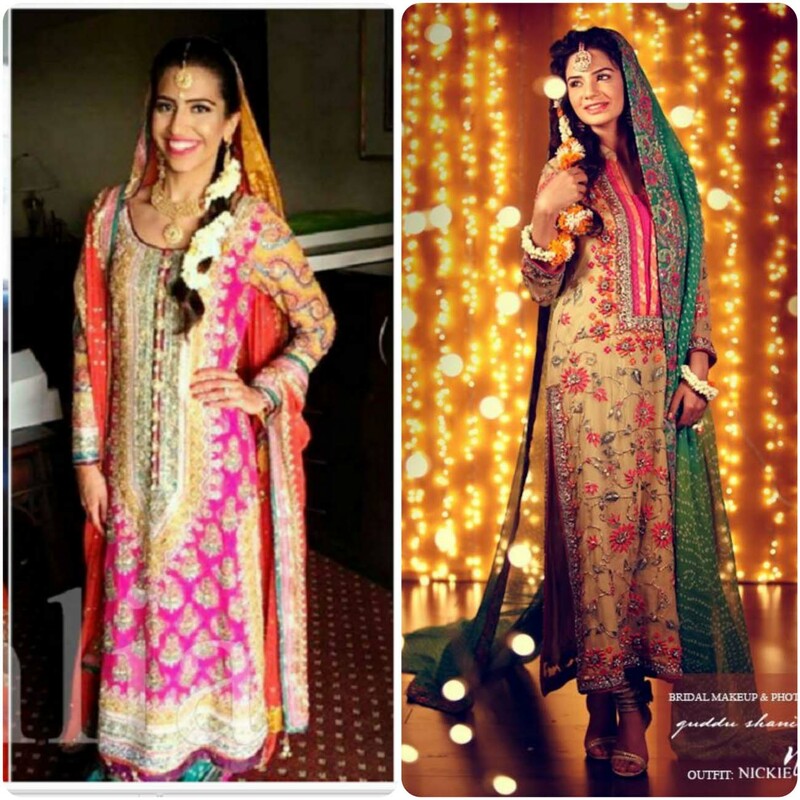 So, mehndi dresses also getting more variants and styles according to latest trends. 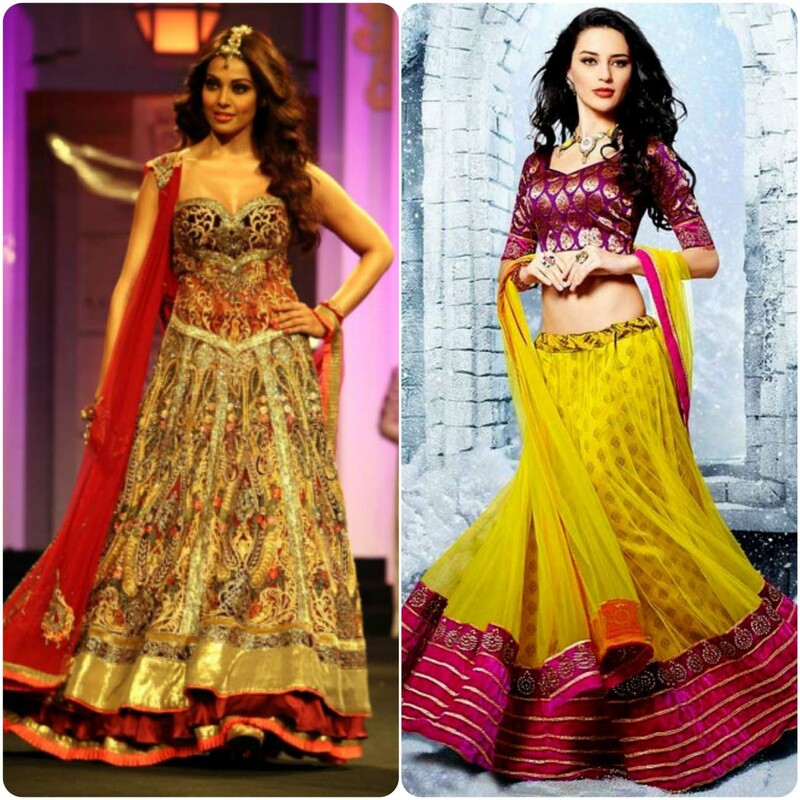 Lehenga and shararas are usually preferred for this and both of these are alternating each other. 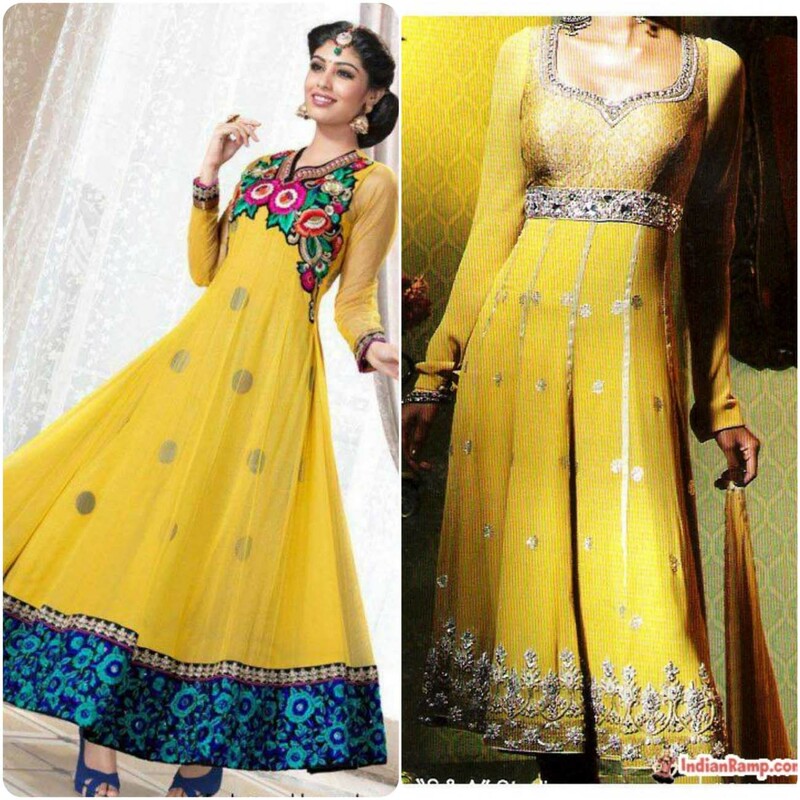 The old has gone yellow color is now again come back into fashion industry. 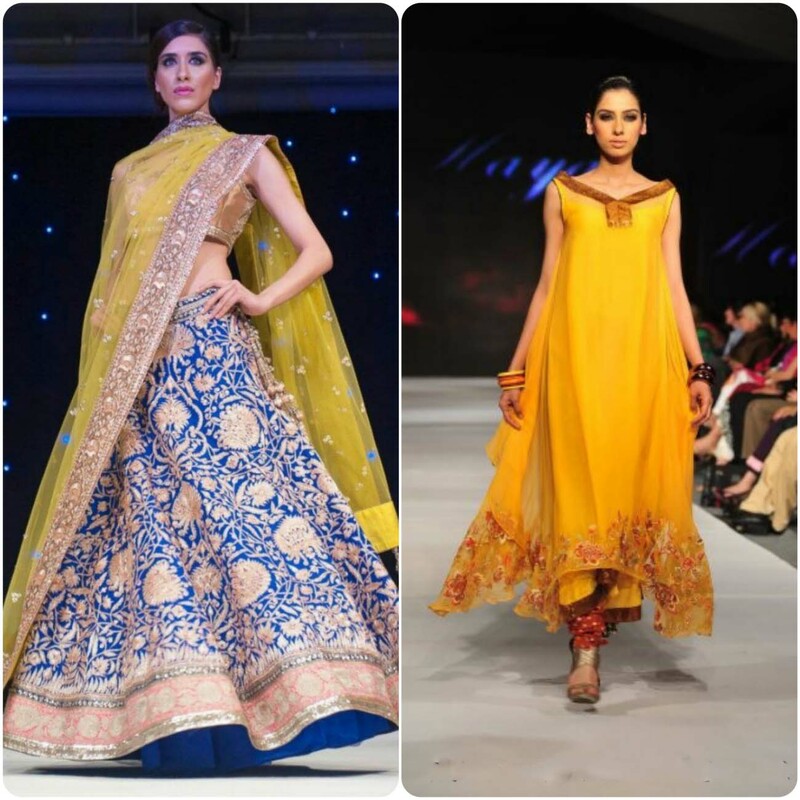 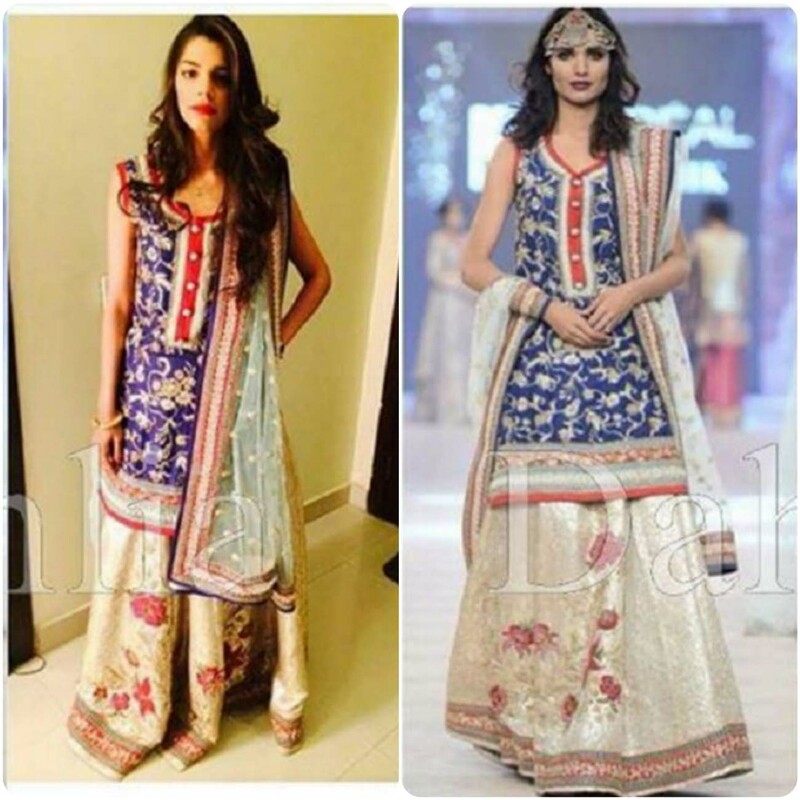 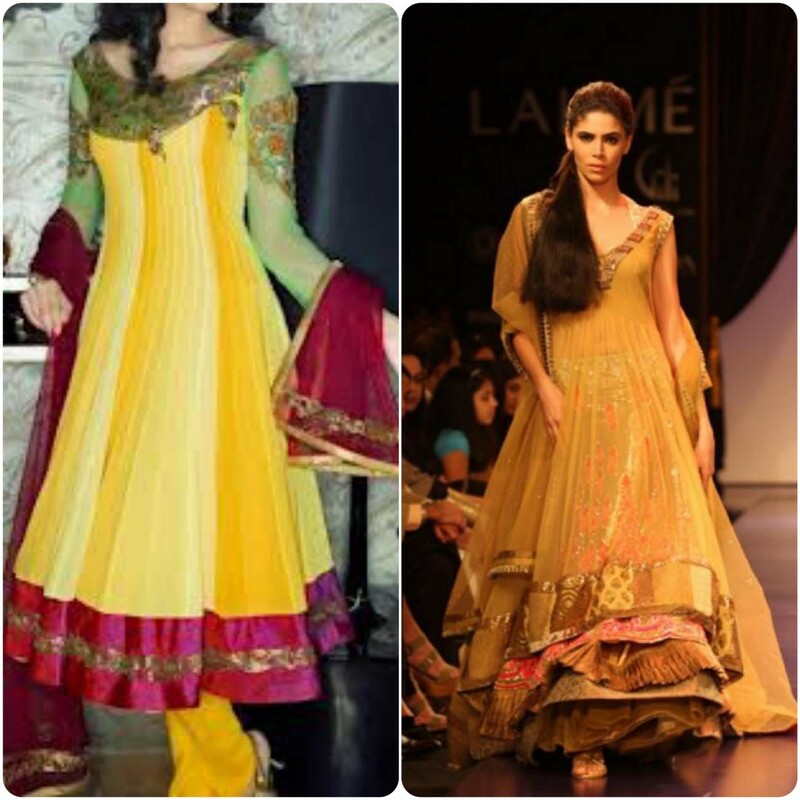 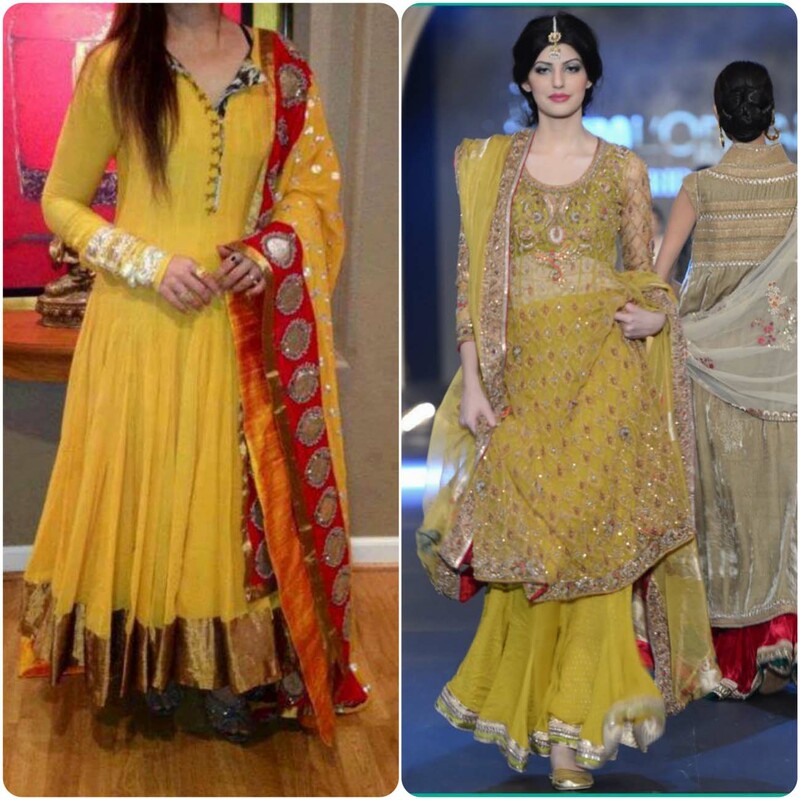 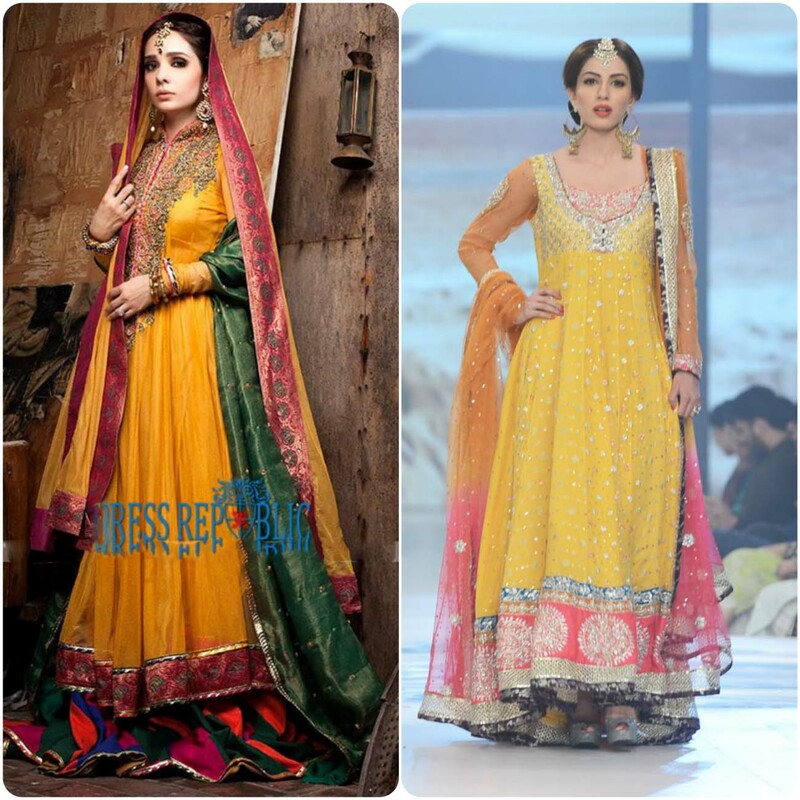 For some time sharara’s remained out of fashion but now stylish girls again opting for it. 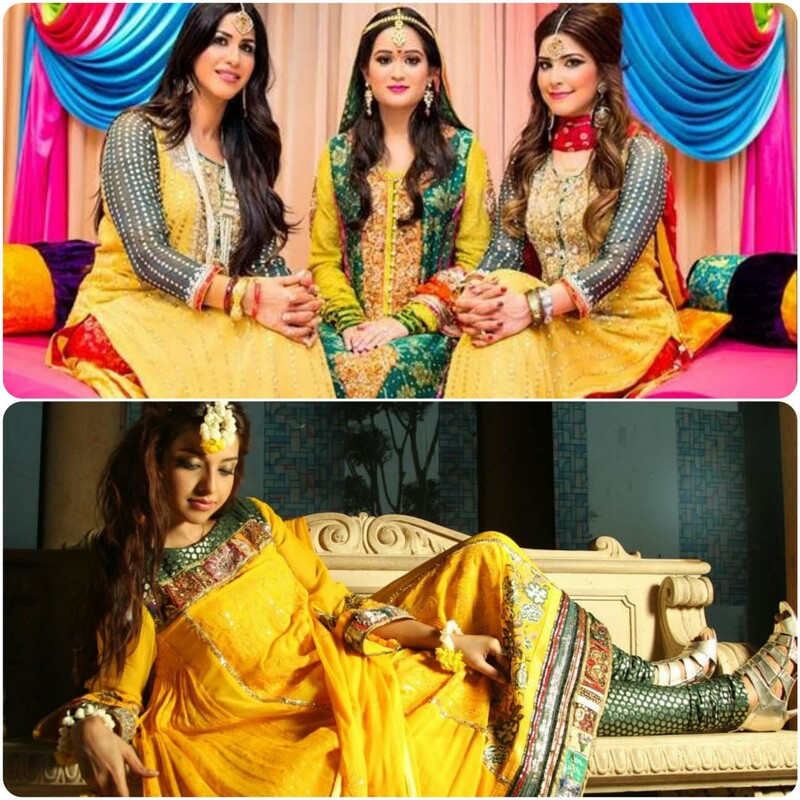 The latest Bridal Mehndi lehenga And Sharara Collection are now launched by all illustrious Pakistani fashion designers including HSY, MARIA.B, Zainab Chohtanni and many more others. 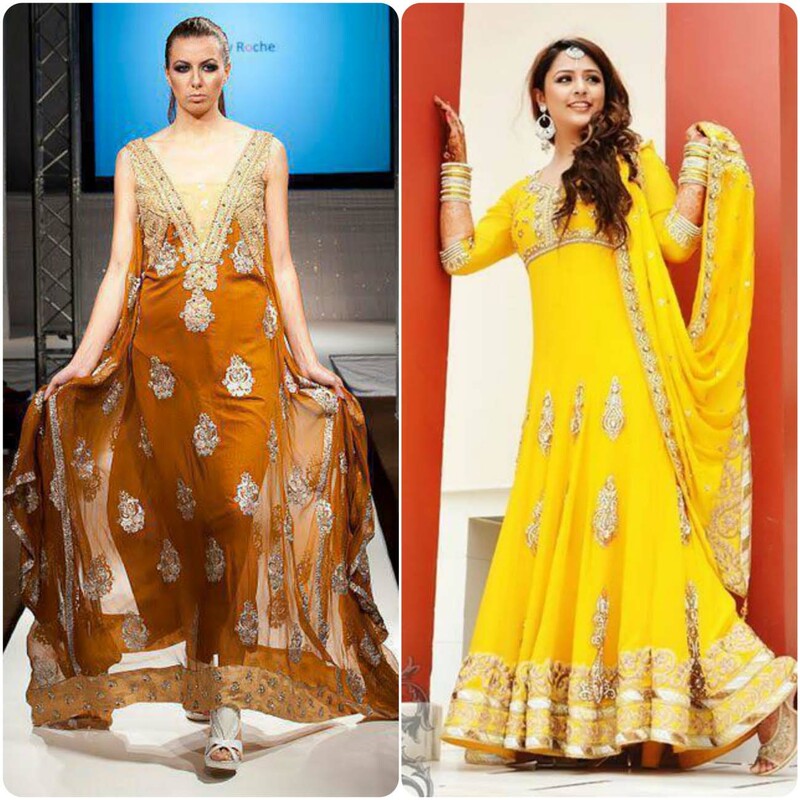 This variety includes various shades of yellow, rust, green and orange. 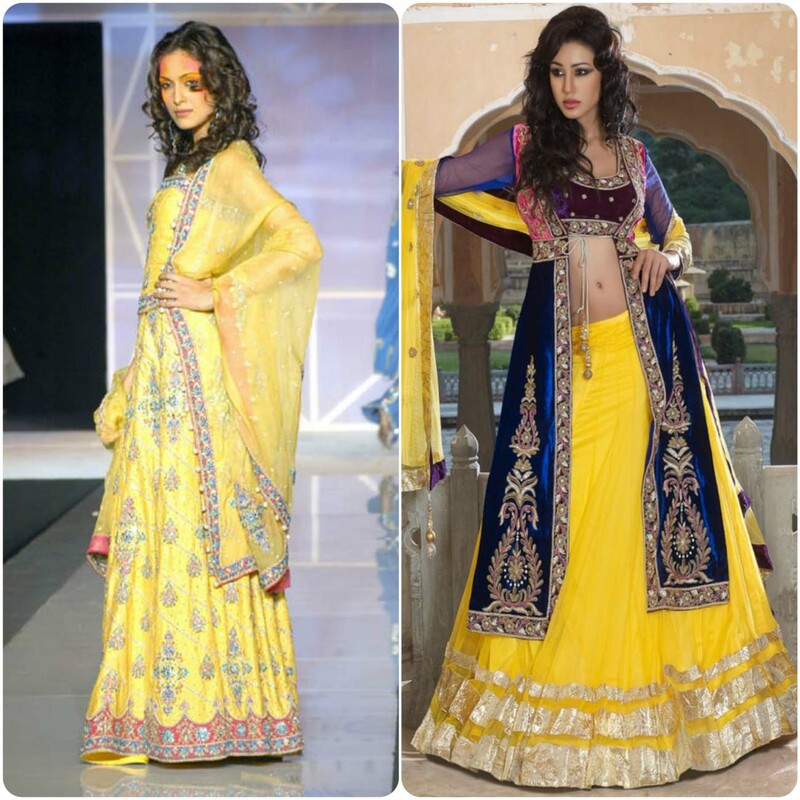 Surprisingly, ivory and yellow are also seen in the spotlight this year and many brides like this mix match of colors. 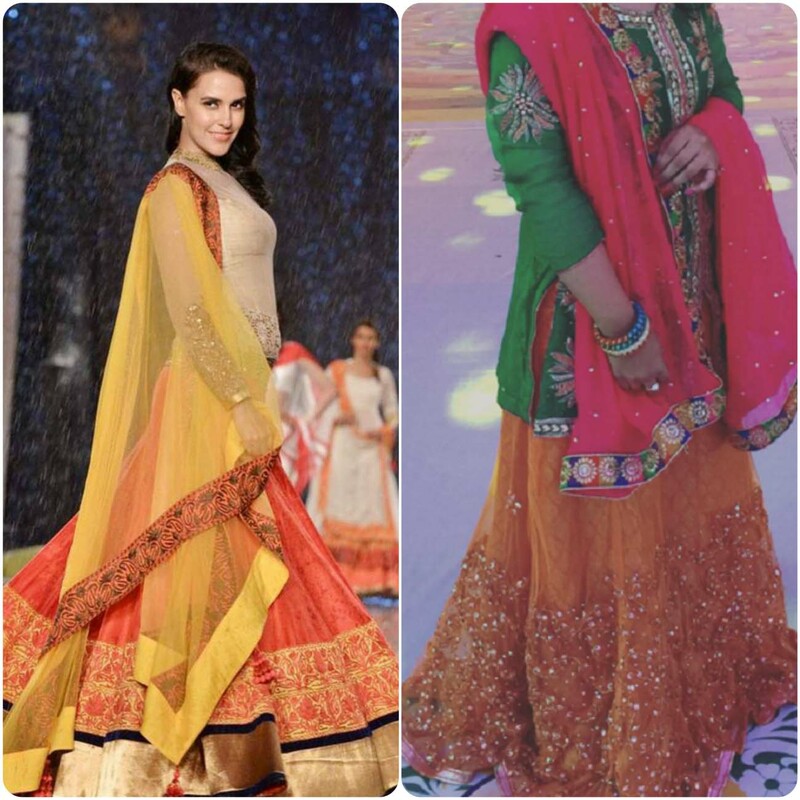 Multi-hued Lehenga’s with hues of pink, yellow, green, purple, magenta, pink and rust are arranged in chain to brighten up the whole attire. 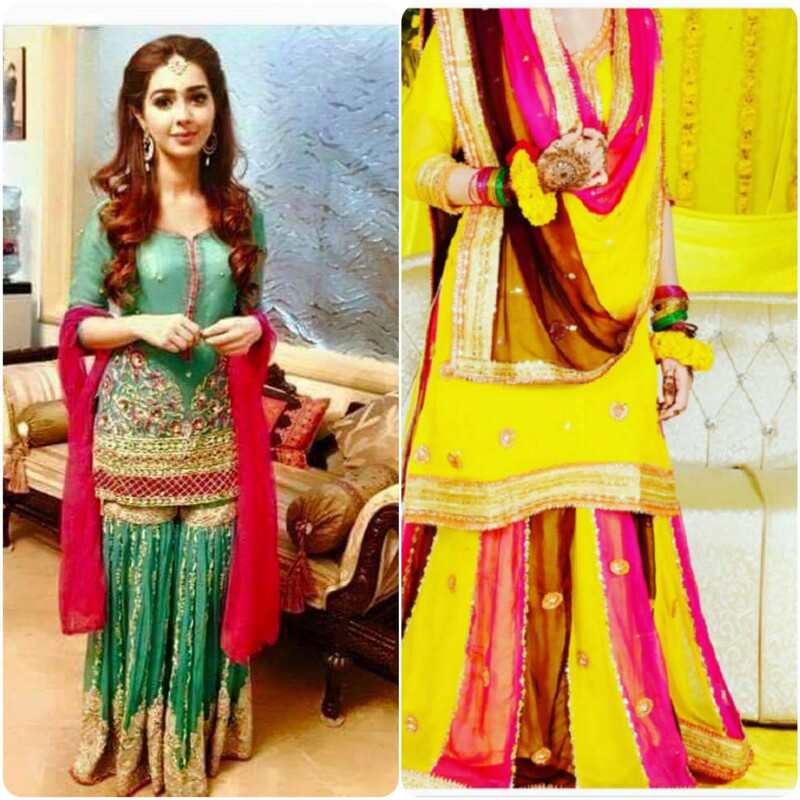 Mostly designers still preffer to make them more traditional, so these attires also contains gotta work on all over dupatta’s borders with the shine of shimmer. 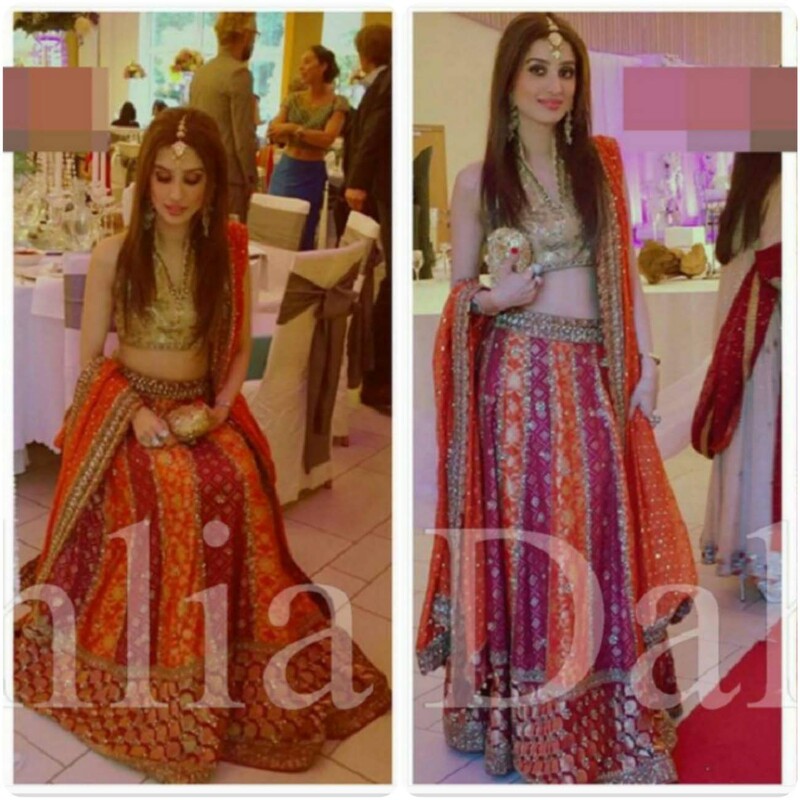 Whereas, shirt or the color of the lehenga are kept simple and plain with light embroidery. 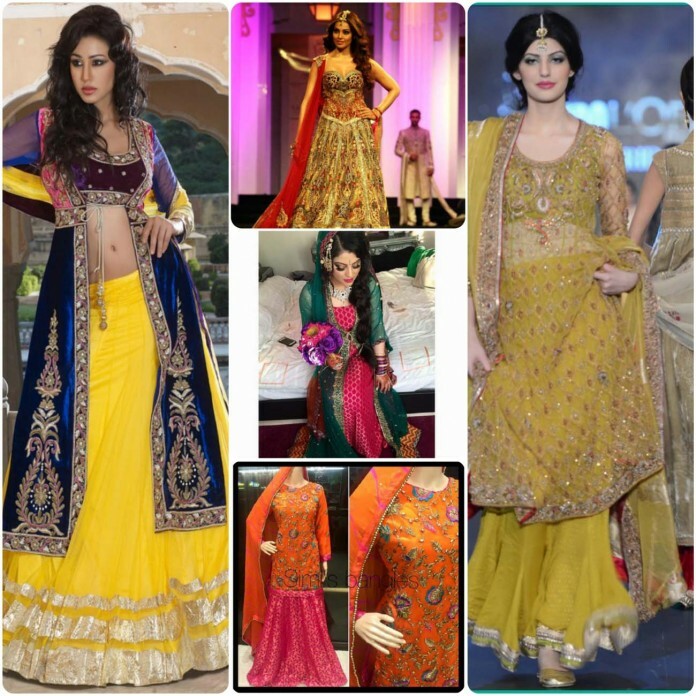 Now a days long frocks and gharara choli are very popular in henna events and they appear to be traditional as well as stunning and elegant. 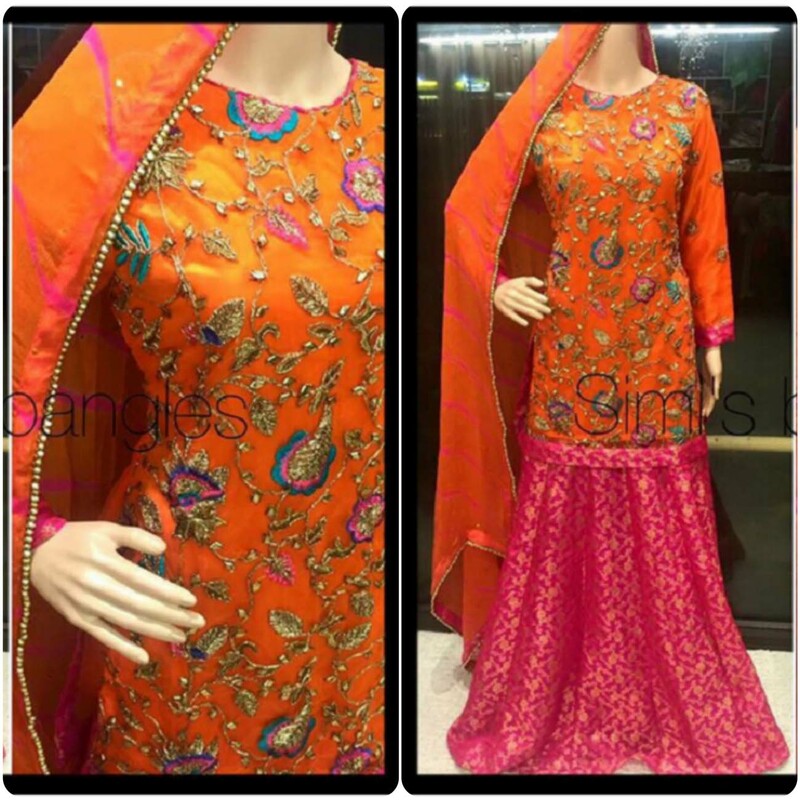 Most of the apparels in latest collection are made of different combinations of fabrics and duppattas in chiffon stuff while shirts and cholis are plain and in jamawars. 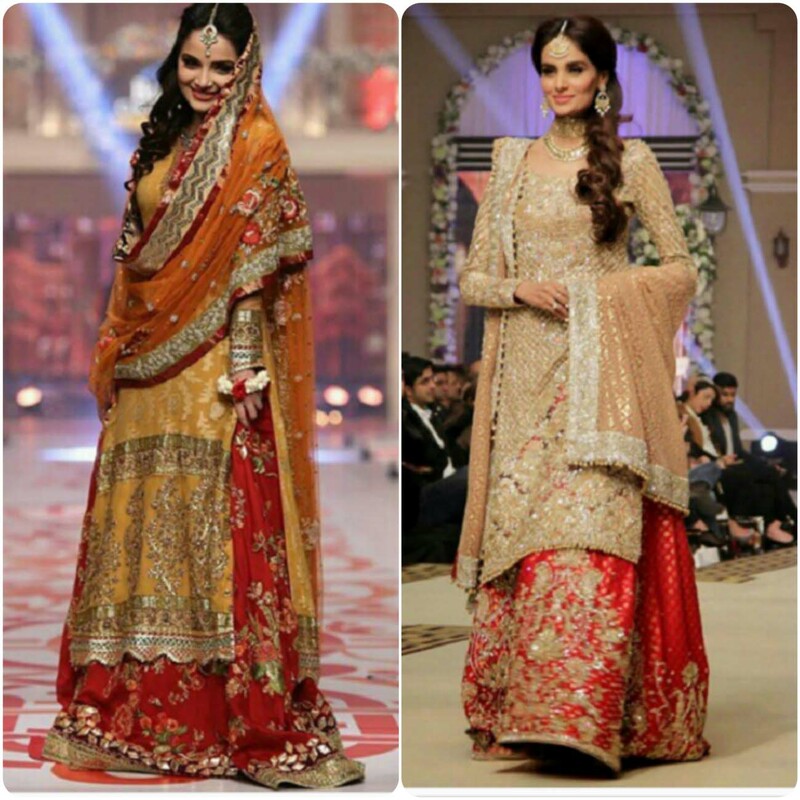 Some of these attires also contain patches of jamawar and different velvet borders. 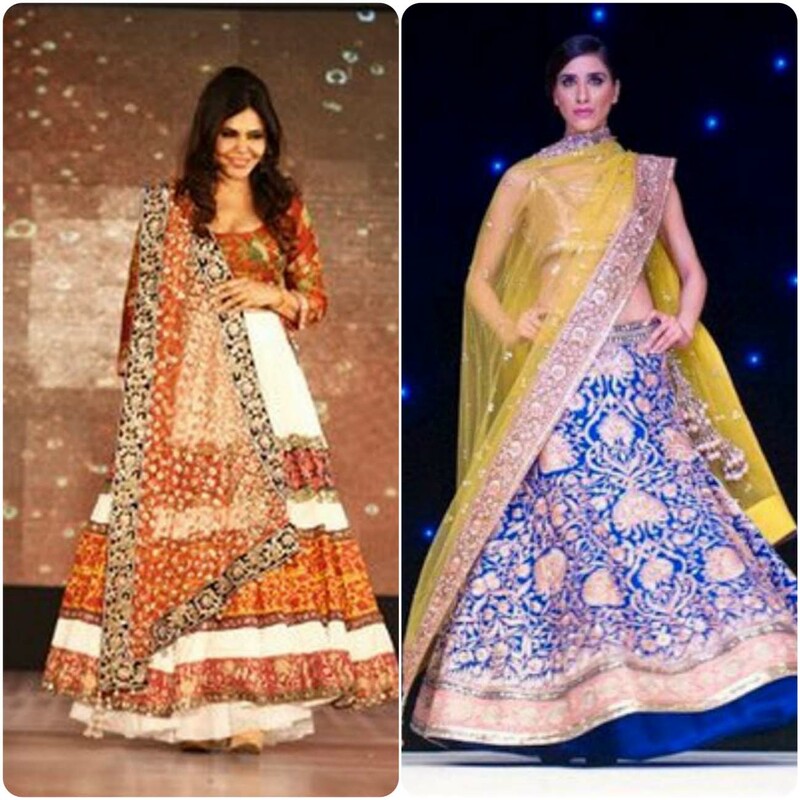 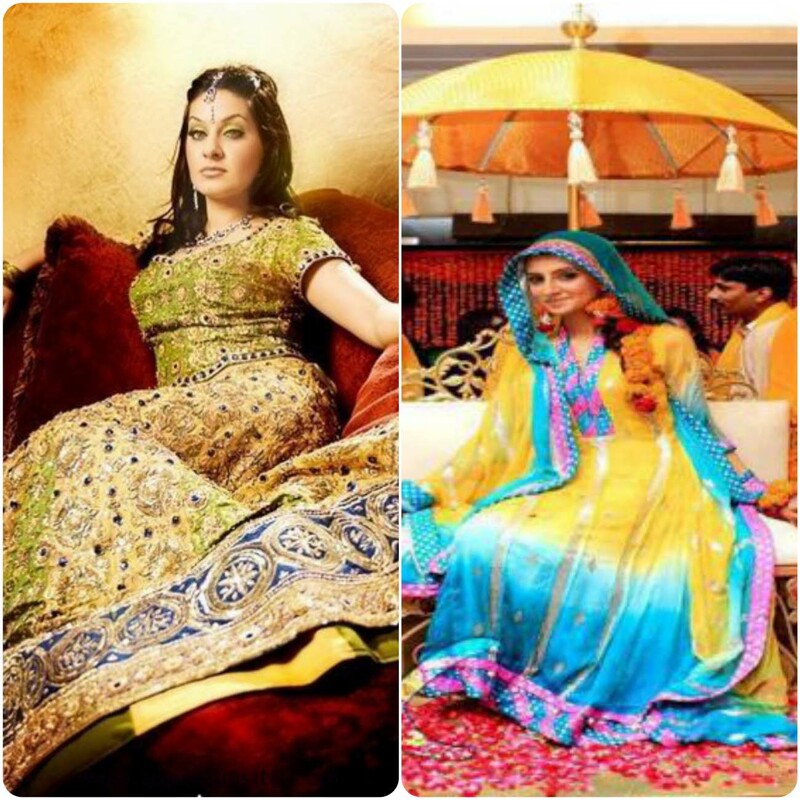 Both of shararas and lehenga cholis are given classy flares. 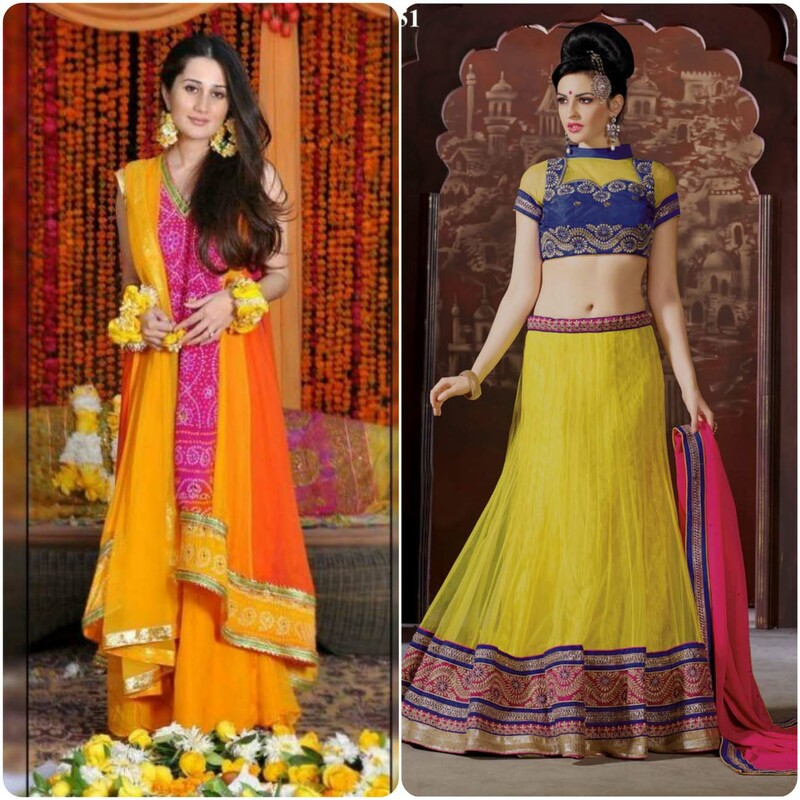 Fishtail lehenga, flared and choli lehenga’s and traditional hyderabadai styles are also available in this range. 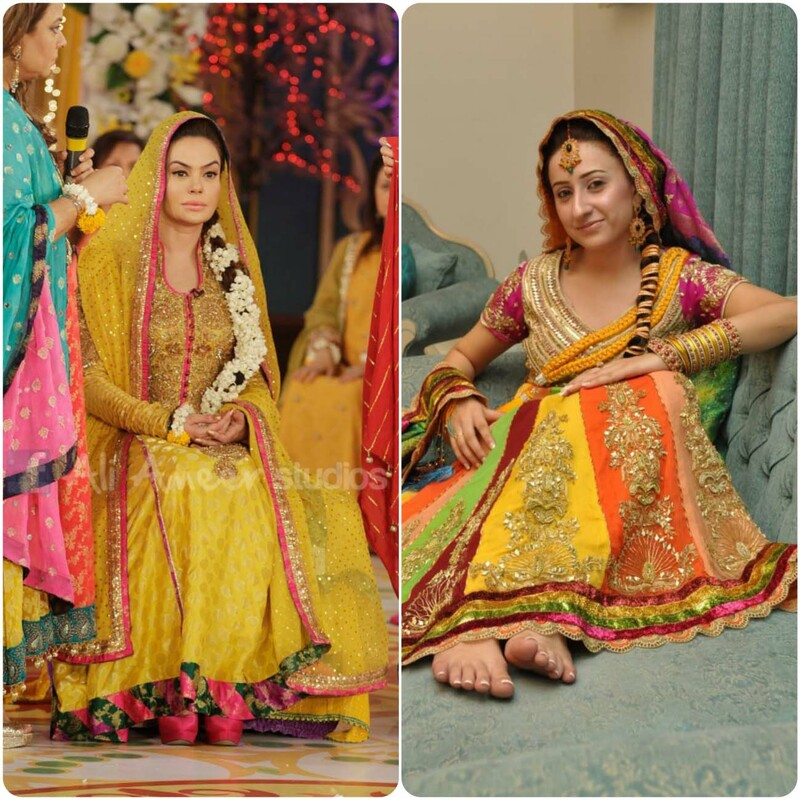 So this wedding gets ready to rock with stunning bucket of attires this year. 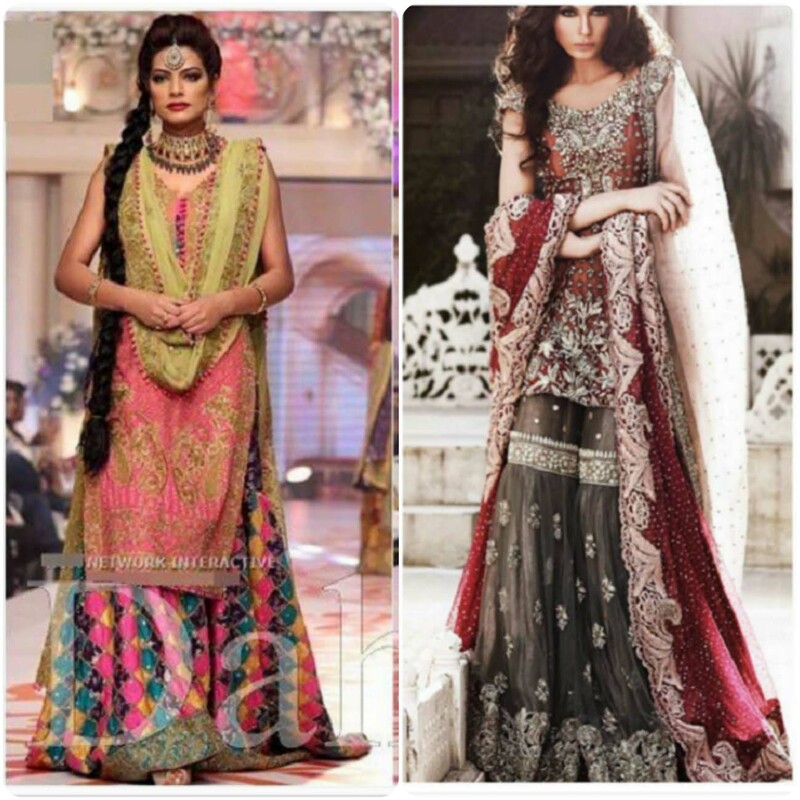 Pakistani brides like to wear Mehndi Dresses in multi shades and they also look more stylish and gorgeous in them.Now most brides like to wear gharara & frocks.